The tongue detects taste sensations that are basic, but it’s the nose that contributes to flavour. It has hundreds of receptors for chemicals that waft off food. The brain draws on all the senses to put together a complex “image of flavour” that stays in our memory. 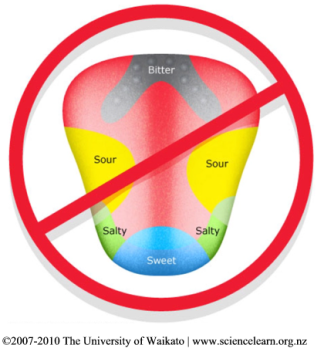 The map of taste on the tongue with its four quadrants of sweet, sour, bitter, and salt, has now been debunked since the 1970’s. It is generally agreed that there is five tastes. A Japanese scientist described it over 100 years ago, and it’s called umami. This taste is a mouth filling savoury taste that is in soy sauce, aged beef, tomatoes and MSG (monosodium glutamate). Taste receptors alone do not produce the taste, but they need to be connected to the taste centres in your brain. There have been recent discoveries of identical taste receptors in other areas of the body such as pancreas, intestines, lungs and even testes! We don’t taste with them but if the lung’s bitter receptors pick up an undesirable inhaled substance, then a message is sent to the brain, and we cough. The other areas … I don’t know. Without the sense of smell we do not taste. Although the tongue map does not exist, there may be a taste map in the brain, called the gustatory cortex. Only a small amount of our experience with food comes from our taste buds, the rest is really a sort of backward smelling. Most of the flavour we detect is in the retronasal area of the nose, i.e. from the back of the nose near the throat. If you pinched your nose and put a drop of vanilla on your tongue you won’t taste anything. Let go of your nose and the vanilla flavour is noticed. Vanilla evaporates at the back of the nose and the receptors here send messages to the brain. Together with information from taste buds, and other senses, the brain builds up the up the experience of flavour.